Hog Roast Galashiels Catering For Sue’s 60th! We were very pleased to cater for Sue Smith’s special 60th birthday in Hog Roast Galashiels recently. Sue contacted us after our services were recommended to her by a friend, as she wanted a party with a difference! She checked out our website and liked what she saw. The venue was in the grounds of a spa hotel and we were more than happy to provide catering in the open air. Awnings and shelters ensure that if there is a drop of rain, then nothing goes soggy. But the weather was kind on the sizzling 60th! Not wanting to go with a ‘traditional’ cold buffet, nor a formal sit down three course dinner, Sue wanted something that would enable her guests to choose what tempted them, and a different sort of fare! And being such a special birthday, she wanted to have a memorable day. Having some family members who are vegan meant that catering for everyone’s needs was extremely important to our host. We were able to provide several vegan dishes so that these party goers had several options. These choices were available at a different food station so that the vegans did not have to visit a table with meat on, another important factor! 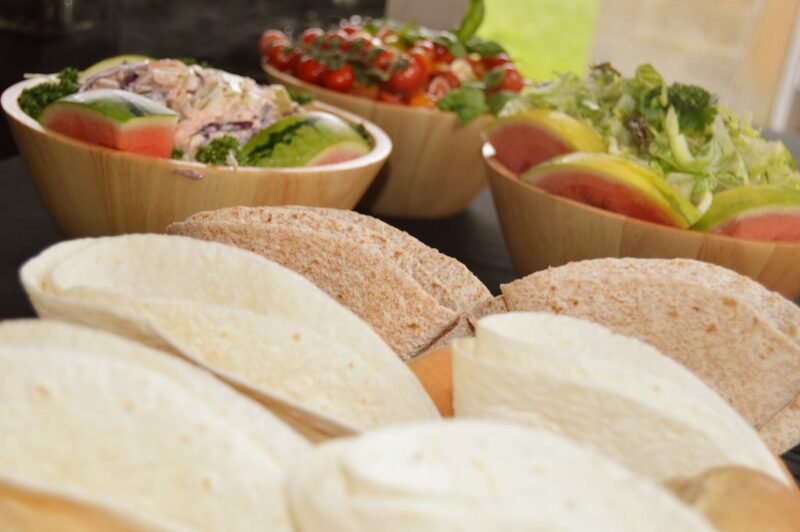 Hot and cold food choices meant that everyone had a variety and our fresh, interesting salads added colour, flavour and healthy food for all people visiting this fun party at Hog Roast Galashiels. Many people we have catered for, have been excited to attend our events. The mouth watering smells and the sizzling sounds do indeed add a difference to gatherings! Our friendly and fun staff make sure that guests are served with not just tasty morsels, but with an engaging smile and an unforgettable professional, courteous manner. Sue was very happy with our involvement and we were very proud to be present at Hog Roast Galashiels! Our attention to detail and tailor making everything to suit our host gave a personal service that is what keeps our business growing!